Bought one of these 2 years ago and replacing as the non stick coating is beginning to wear. I waited until they were half price again and thought I would share the good news! I reckon for a tenner they are excellent value and saves at least that much in pan scourers!!!!! My wife is Filipina and reckons they cook rice perfectly. We eat rice every day and we do have to adjust the amount of water we add when we buy a new sack of rice until we get it right. It usually takes only a couple of attempts until we have the rice as we like it. We use it for anything between 2 and 8 portions and would never cook rice on the stove again! Put rice in add water switch it on! No need to watch it and we always give it 40 minutes for rice how we like it. Serve then just pour in water and after dinner wash it. No burned pans and no scrubbing! Just to answer the reviews on the Argos site, the cooker cooks up to 1.3 litres of dry rice which makes up to 2.5 litres of cooked rice! 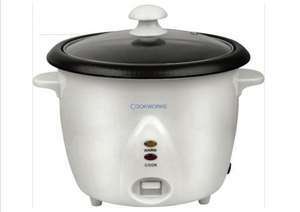 Value rice cooker with 2 different settings; 1 for cooking and 1 for keeping warm. Cooks up to 1.3L of dry rice. •Includes: spatula and measuring cup. Try adding a little Schwarz Pilau Rice seasoning if you fancy a change from 'plain' rice. 8 mins 850 kw Microwave who needs a rice pot ! I have one of these bought for same price. It's just over a year old. The coating has started to come off the bowl. I have one too. Is excellent. Buy it, buy it now. Does anyone actually use this. Far easier just to get the bags that you stick in a pan of boiling water. So OP confirms that it wont last you 2 years! I'm surprised it hasnt melted or blown up being a Cookworks! Awful brand - and dangerous! Rice everyday?! The dullest staple food in existence? Well, ok! Hot! Bought one last time but very poor coating which has peeled so rice sticks or burns. Very good product. One of the best purchases i had last year. Voted hot. bought one only a couple of days ago, great product! Does anyone actually use this. Far easier just to get the bags that you … Does anyone actually use this. Far easier just to get the bags that you stick in a pan of boiling water. those plastic bags of rice are horrible.only good if you rarely eat rice..they just taste plasticy and too moist and cheap..yuk. same can be said about microwaved rice. next easy and good tasting option is this electric rice cookers.I always use them.perfect rice everytime in just 20 minutes. I've had mine since November and I haven't noticed any paint coming off the pot yet, could just be that it's too soon though... either way this a great little bit of kit if your terrible at burning rice or even pasta! those plastic bags of rice are horrible.only good if you rarely eat … those plastic bags of rice are horrible.only good if you rarely eat rice..they just taste plasticy and too moist and cheap..yuk.same can be said about microwaved rice.next easy and good tasting option is this electric rice cookers.I always use them.perfect rice everytime in just 20 minutes. That's rubbish. I eat rice all the time and the bags are just as good anything. I would not waste my money on a stupid rice cooker. That's another thing that would end up under the cupboard along with the tostie maker, the bread maker, the ice cream maker, the slow cooker, the list goes on all just a waste of money. Buy the bags they are the best. You obviously haven't tried Veetee micro rice. That is nice but it's expensive. I just buy the plastic bags, Asda's own make 8 for £1.38 and it is excellent. As I get older I tend to eat less meat (but better quality) & as for rice being bland! ..only if you eat it plain! ...otherwise it's a very versatile food that begs to be mixed with a vast variety of flavour & texture, frankly I'm jealous of the op! If you use a good soy (there are a lot out there) which appeals to your particular likes (I use 4 varieties generally) then it's incredibly moreish & low calorie food, typically a tablespoon (as I recall) has around 11 kcal per soy serving , & as it's strong flavoured extends over a good large helping of rice if trying to shift a few lb's without going overboard on salt (which I don't cook rice with). with the sealed plastic containers / bags f rice you don't tend to get fluffed rice, it's often moisture laden & heavy, Heck I don't even get that when making quick sticky rice balls. These rice cookers can easily change a Brit's stock attitude to rice,(yews I was guilty of boiling it to death as well) ..it's means of cooking by less energy & little water makes for sense on all fronts! Hope no-one is daft enough to put a deal up for a posh japanese rice cooker, then we'll see some flame wars & vitriol. for under 10 quid, this is definitely worht a go, rice cookers cook well & keep it warmed nicely for the duration of your meal (should you want extra) ..one large bowl can do me for a few days with a very quick reheat in the microwave. Try it rather than knock it possibly folks! I dont understand anyone who burns rice in a pan oO You DONT need to have any heat in the pan to cook rice, here is my easy peasy 4 step guide to perfect rice and virtually NO MESS! 1 - Boil up enough water in the kettle (enough is when the rice is covered by about 1 inch of water) pour the water into the pan. Cheap and works great. Im not sure if this is the same rice cooker that argos bundled with a cookworks kettle a while back but its still a good deal! how many cups of water per cup of rice are you suppose to use ? Typically the same in water as you do rice, ..the simple way, though i'm sure the rice "pro's" who wash rice etc, can give a better idea. Typically the same in water as you do rice, ..the simple way, though i'm … Typically the same in water as you do rice, ..the simple way, though i'm sure the rice "pro's" who wash rice etc, can give a better idea. That is nice but it's expensive. I just buy the plastic bags, Asda's own … That is nice but it's expensive. I just buy the plastic bags, Asda's own make 8 for £1.38 and it is excellent. Veetee is retailing in quite a few places now for less than a quid each, good to see you agree it is good and contradicting your own sweeping statement re micro rice. Will look out for the 8 for £1.38 next time in Asda and give it a bash on your reccomendation. Will these even make the smartprice rice taste good lol? Deal posting newbie! This is k129048218 first deal post. Help out by leaving a posting tip or just to show your appreciation for their contribution.